Designed specifically to increase the number of your students scoring Meet and Master Grade Level on the STAAR Algebra I Assessment. We strive to help all students reach Meet and Master Grade Level. 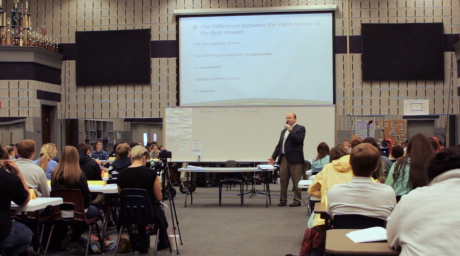 STAAR Algebra I plays a crucial role in measuring a high school's accountability in math. Directly aligned to TEKS and the STAAR Algebra I Blueprint, the STAAR Algebra I Boot Camp is a half-day event designed to increase the number of students scoring Meet and Master on the STAAR Algebra I assessment. Students will be prepared with content remediation and strategies for both multiple-choice and grid-in items. The event covers the most frequent content standards in addition to their related process standards. Through extensive research and careful analysis, our Boot Camp workbooks contain the most frequently tested content in the same proportion as found on the STAAR Algebra I according to the TEKS and Blueprint standards. Fill out the quote request by April 27th and we guarantee to fit you into our availability this semester. Call (855) 922-8773 or fill out the form above to learn more about how we can help prepare your students for the STAAR Algebra I test. Facilitator was extremely motivating, knowledgeable, and enthusiastic during the session. Students were highly engaged and asked for more sessions with the instructor. Great job!